Skiers look out over the Andes. The Southern Hemisphere allows skiers to treat themselves to year-round snow sports, with the main season being between June to August or September. Explore Australia, New Zealand, South America, the Andes, Antarctica and South Africa while it's still summer up here in the U.S. Despite the beach culture, 3.5 million people head for the hills in South Wales and Victoria each year. The highest European-style resorts are found in New South Wales - Thredbo and Perisher are the two leading contenders. The majority of resorts are situated in Victoria, of which Falls Creek and Mt. Hotham are the biggest. The latter has the advantage of its own airport so it is possible to fly in direct or from Sydney and Melbourne. Mount Hotham reasonably claims to be a first-class resort with 85 runs and good Aussie après-ski. Thredbo and Snowy are two of the most popular resorts; you can drive to Snowy from Sydney in five hours, which in Australia is not so far. The island of Tasmania boasts its own downhill resorts. It's doubtful that anyone would fly in from Europe especially to ski Tasmania, but combining skiing with touring the spectacular Ben Lomond National Park is a realistic option. There is also Mount Mawson in the Mount Field Park. 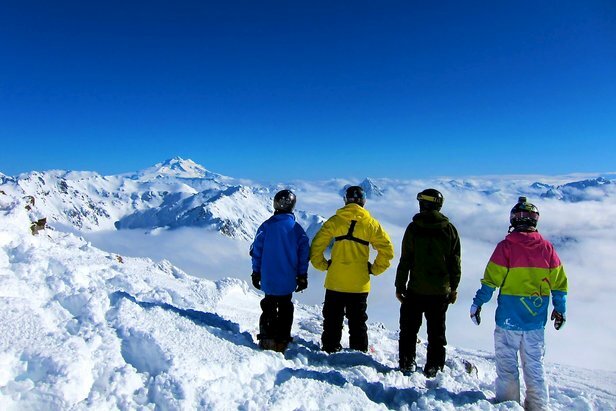 New Zealand is a first-class skiing destination with good resorts, mostly on South Island. The two largest and highest - Whakapapa and Turoa - are on Mount Ruapehu, North Island. A day's pass costs U.S. $99 at Whakapapa with the highest ski point at 2,300 metres (about 1.5 miles). There is a carpet lift for small children at Turao, as well as New Zealand's only lift accessed glacier skiing. Private ski clubs are a feature of the ski scene here to keep skiing affordable. There are seven Andean countries: Argentina, Bolivia, Chile, Columbia, Ecuador, Peru and Venezuela. The longest in the world, the Andes stretch out 4,350 miles with an average height of around 4,000 meters (2.5 miles), which means skiing is possible and spectacular in all of them. Heli-skiing and freeriding is very popular. For years Chacaltaya was the pride of Bolivian tourism as the highest ski resort in the world. The Club Andino Boliviano mountain refuge is still there at 5,300 meters (3.3 miles) with a fantastic view towards Lake Titicaca, 25 miles away. Unfortunately the glacier disappeared last summer ahead of climatologists' expectations after an estimated life of 18,000 years. The honor of the highest ski destinations now moves to the northern hemisphere: the Dagu Glacier in China and Gulmarg in India. Venezuela's sole resort, Mérida, has a cable car that starts at 1,577 meters (just under a mile) and rises up over rocky crags close to the top of the country's highest peak - Pico Bolivar (4,981 m; 3 miles) with three small glaciers. The skiing is for the competent and intrepid. There are big drops and not a lot of safety netting. The après-ski is Latin American and lively, as Mérida is a university town. Columbia boasts the Los Nevados range and a road track up to 4,900 meters (about 3 miles). There are huts on the three highest mountains in Ecuador - Chimborazo, Cotopaxi and Cayamba. Note that if you reach the top of the inactive volcano of Chimborazo (6,268 m; just under 4 miles), you are at the farthest point from the centre of the earth thanks to the equatorial bulge. Backcountry skiing and mountaineering in Peru is possible based on Huaraz (3,000 m; 2 miles). There are no ski lifts, but donkeys are available for carrying kit or even climbers. There are skiers and races at Pastouri but no resort, facilities or ski lifts. Argentina and Chile both have well-groomed slopes, halfpipes, terrain parks and ski-in, ski-out accommodation. The best and most modern resorts are on the Chilean side. Chile has 2,500 miles of terrain reaching 3,000 meters (2 miles) in altitude. Portillo, South America's oldest and most famous ski resort, is located on the edge of Inca Lake. It offers a stunning setting and is especially popular with experts for its steep, off-piste terrain. Valle Nevado, 28 miles from Santiago, is the biggest ski destination in the southern hemisphere. It was constructed in 1988 by French entrepreneurs along the lines of French Alpine resorts. A day's pass costs U.S. $68 weekdays. Nevados de Chillán amongst the volcanoes, is a ski and spa resort in a forest. The small resort of Cerro Mirador at Puntas Arenas in the national reserve of Magallanes towards Cape Horn is a curiosity with a marvelous view over the sea and mountains. It is known as the world's most southern ski destination and the ever-changing windswept snow formations make the landscape magical and unique - so dress warmly. Valle de Las Lenas in Argentina is the highest resort with a top elevation of 3,340 meters (a little over 2 miles) and a descent of 1,100 meters (about .5 miles). It lays claim to South America's most modern lift system. Cerro Catedral Alta Patagonia in the Bariloche Region has a maximum ski height of 2,050 meters (about 1 mile) and a maximum descent of 1,000 meters. The ski lift arrangements are top class, and the city of Bariloche is modern with a beautiful view of the Andes. Bloggers who know the resort warn to beware of school holidays but recommend it for honeymoons. The hut system is excellent and it is possible to do trips of several days trekking from one to the next. Purists might claim that Mawson Station, Scott Base and neighboring McMurdo Sound in Antarctica are the most southerly skiing destinations, and each have one drag lift for local scientific workers and visitors. Some 46,000 tourists visit Antarctica annually by sea or plane, with a robust après-ski scene, especially in U.S.-operated McMurdo Sound that also boasts a café with the best coffee in Antarctica. Stick to established tracks after a drink, as ice crevasses abound. Skiing can be found not too far from Bloemfontein, Lesotho in the Drakensberg Mountains at 3,222 meters (2 miles).